The web’s place in our daily lives is undeniable. We can now access the Internet from our home computers, office, laptops and our phones. But even with this close intimacy many people still aren’t entirely sure what the Internet is and how it really works. This guide is available to download as a free PDF. Download How the Internet Works now. Feel free to copy and share this with your friends and family. 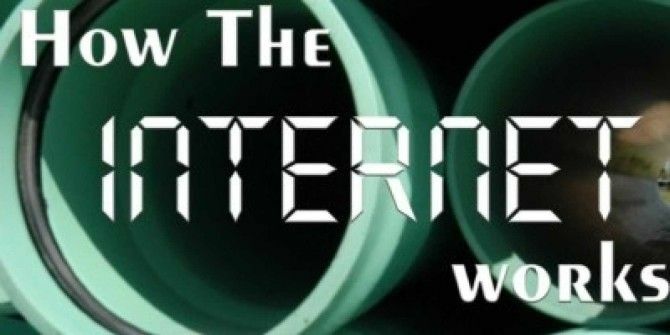 We aim to change that with MakeUseOf’s latest PDF guide, “How The Internet Works.” This guide, by Taty Sena, explores the hardware, software and organizations that power the modern Internet. You’ll learn about everything from the history of the Internet to the organizations that make it possible today. If you read MakeUseOf you probably use the Internet every day, so educate yourself. You don’t need to know how the Internet works to use it, of course, but that doesn’t mean anyone can’t benefit from a quick overview. It is impossible to deny the influence of the Internet. In the 1990’s it quickly changed from an exciting technology few understood to something so prevalent most can’t imagine living without it. The World Wide Web is a powerful thread that connects the entire world, one that allows us to share information like never before. The benefits of accessing so much information are too many to list, and while some problems are also becoming apparent, the web’s place in our daily lives is undeniable. We can now access the Internet from our home computers, office, laptops and our phones. But even with this close intimacy many people still aren’t entirely sure what the Internet is and how it really works. This guide explores these questions, starting with a bit of history. Like most revolutionary ideas, the Internet started with a few people who dared to dream the impossible So Who Created The Internet? [Technology Explained] So Who Created The Internet? [Technology Explained] Read More . The year was 1962 and Leonard Kleinrock (pictured) at MIT had just published the first paper on packet switching theory, which was the technology that allows information to be transferred as packets of information. At the same time, a man named J.C.R. Licklider of MIT wrote a series of memos describing a “Galactic Network,” which would allow people to access information from anywhere. The story could have ended there. But, as it happens, Licklider was the first head of the computer research program at DARPA (the research and development office for the U.S. Department of Defense), and convinced his successors that researching networking processes was an important undertaking. In 1965, MIT researcher Lawrence G. Roberts, along with Thomas Merrill, connected the TX-2 computer in Massachusetts to the Q-32 in California with a low speed telephone line. This project, sponsored by ARPA, intended to study a “cooperative network of time-sharing computers”. That was the first time a long distance computer network was created, and it helped show researchers that it could work— although it also showed them how inadequate phone lines were for the transmission of information. In 1966, using the knowledge he had acquired from his previous experiment, Roberts put together plans for the creation of the “ARPANET”, which would eventually become the modern “Internet”. The development of the ARPANET was not without major glitches. Charley Kline at UCLA sent the first packet ever using the network as he tried to connect to Stanford Research Institute on Oct 29, 1969. The first word he tried was LOGIN, but the system crashed when he reached the letter G.
By 1972 Ray Tomlinson created email for the ARPANET and started using the symbol “@” for email addresses. In 1973, a protocol called FTP What SSH Is & How It's Different From FTP [Technology Explained] What SSH Is & How It's Different From FTP [Technology Explained] Read More (File Transfer Protocol) was created to allow files to be transferred to hosts as sites (more on that below). That is the protocol used today to upload files to servers and websites. By 1981, Listserv software made the exchange of information easier, and by the 1980’s, the first private ISP (Internet Service Provider) appeared. The Internet started to become broadly used in the 1990’s. The first search engine— Archie, from McGill University in Montreal—was created. This was followed in 1991 by WAIS and Gopher. Lycos was created in 1993 and Yahoo was founded in 1994, but the major change in how people searched the web happened in 1998, with the launch of a clean and efficient little search engine called Google. Although Google cannot be credited with the development of the web since the late 1990’s, it serves as a major turning point in its popular acceptance. Within a short time, “to Google” would become a verb synonym to searching the web. During the 90’s major investments had been made in the field of technology, and investors and companies saw the web as the new portal for their investments. So many of those investments went badly that 2000 is known as the year the dot-com bubble burst, with the majority of the high investment dot-coms going down during 2001 and 2002. The irony of the dot-com bubble burst is that the Internet would, in the years after the burst, prove itself immensely profitable and a major focus of investments once again. It matured to become such a part of people’s lives that it had begun to threaten the existence of companies that refused to create a strong presence online. From the users’ end, computers are a direct link to the Internet. A computer with Internet access is necessary for retrieving files served by websites. Most computers are adequate for that task, but naturally as the web grows more and more complex so does the computing power needed to take advantage of it. There are currently a few different types of cables How To Make Your Own Ethernet Cables How To Make Your Own Ethernet Cables Read More that can be used to connect a computer to the Internet. The most common ones are phone lines (for DSL and modem users) and Broadband RJ-45 (ethernet) cables. The phone line can connect users to a modem connection directly, or be connected to a router for DSL users, and then to an RJ-45 cable. Broadband cable and T1 users don’t use a phone line, but use HFC and RFoG networks instead. Internet service providers are the companies that you pay to get Internet delivered to your house or workplace, such as Time Warner Cable, Comcast or Verizon DSL. They are the links between you and the large network we call the Internet, so by paying a fee they can give you access to their infrastructure and connect you to other computers. What you are really paying for is for the usage of their hardware: their cables, computers, routers, modems, the workers who maintain them and the real estate that is required to hold that hardware. The Internet itself and the information stored in it is, for the most part, free; without an ISP, however, you would not have access to it. The information you see online needs to be stored by computers called hosts, or servers, which are constantly sending the information to the World Wide Web. Most major web hosting companies have huge buildings with hundreds or thousands of servers to store the websites they host. When you type a website address on your browser, they receive the request and send out the information that appears on your browser. You can turn your own computer into a server, but it would probably serve the pages slowly if many people are trying to access the site at once. Websites have public IP addresses, which are their identifiers online. For example, we all know that to reach Google, you can type Google.com on the address bar. Google’s real IP is 66.102.7.99 , so if you type that on the address bar, you will also find Google. Let’s say your address is 125 Happy Street, but you decide to put a sign on your door that says “Bob’s House”, which covers the street number. You can then tell your friends to look for “Bob’s House”, which would be easier for them to remember, but your real address still is 125 Happy Street. In this analogy, then, “Bob’s house” is your Domain Name (below) and 125 Happy Street is your IP number. Makeuseof.com’s IP address and server location. The domain name is basically the address of your website, a nickname for its IP address. Domains can be assigned to IPs by a Domain Name Registry headed by the Internet Assigned Numbers Authority (IANA). Basically, you can go to a registrar, such as GoDaddy.com or NetworkSolutions.com, purchase a domain and point it to where your site is hosted, so that when people type in your web address, they are taken to your website. The top level domains are the ending part of the address. In this case, the .org and the mid level domain in this case would be beholders. That would be a URL within the domain Beholders.org. The confusion exists because most people will say, what is the URL for the site and they are given the simplest URL form, where the home of the site is (beholders.org), which also happens to be the Domain Address of the site. The URL usually includes much more information though, such as the specific page address, folder name, and protocol language. beholdersgroup/ – Folder or sub-category where the page is. projectswesupport. – Name of the page where the information can be found. html – Language protocol used to write the page. Protocols are different rules and languages that are used to exchange information or data. Below are some examples of the most used web protocols. Most sites in the world make use of at least some html to display their information, although many larger sites being created today are connected to some form of database and use other languages which are considered more “dynamic” than HTML is. You can view the code on most webpages by using the view source option in your browser. Most of what you will see is HTML, since dynamic sites hide their real code when displayed that way for security reasons. So for example, let’s say that a dynamic site has a form to create a user for that site. You type in your information and click “send” or “join”, or a button of that sort. The form will send that information to a database, and tell it to store it on a particular part of the database with tags for your name, address, password, etc. Then let’s say you return to that site and try to log in. When you click login, the page will send a request to the database that asks if that person exists in the database. The database will search for it and if it finds that information if will reply that is does and give you access to your information on the site. If it doesn’t find you, it will tell the page that there was an error and it will probably display a message instead, such as: “User not found”. XML What Is an XML File and How Can You Open and Use It? What Is an XML File and How Can You Open and Use It? You may have seen the term "XML." You might even have accidentally opened an XML file. What is XML and how do you use it? Read More , or eXtensible Markup Language, had its beginnings in 1998 with XML 1.0. XML is a markup language that is mostly used to structure documents and transfer data between applications. It is also a language that can be used very effectively for transfer of information between databases because it is so configurable. Macromedia developed Flash in 1996 as a tool for the development of visually dynamic websites and multimedia content. It filled a gap left by HTML, which was quite static until the recent development of HTML 5. With Flash, people can create sites with moving elements, music and action script which only require one plugin download to be viewed. It was widely adopted and by 2009 it had over 100 million users. Its plugin can be found on most computers with Internet access. Java Top 5 Websites for Java Application Examples Top 5 Websites for Java Application Examples Read More is a programming language released by Sun Microsystems in 1995. It is a platform that has been used for many web and non-web applications, such as games and applications. Much like Flash, it requires software to be downloaded to your computer in the form of a plugin. What Ajax does is basically load information on a page without the need to click on links and reload pages like HTML does. This helps make web pages more interactive, and feel less like a series of documents. Due to this, AJAX is used by many e- commerce sites or resource sites; it’s a way of displaying extra images or text without the user needing to browse to different pages. 5. Who runs the Internet? No one organization controls the Internet; instead, a variety of international organizations work to make it what it is. Let’s take a brief look at a few of these organizations. ICANN stands for Internet Corporation for Assigned Names and Numbers and as the name implies, it is the main organization responsible for legislating and regulating the parts of the web that have to do with domains and their connection to IP addresses. The Internet Governance Forum was established in 2006 as a forum that runs under the United Nations. It is a venue for discussions about the direction of the Internet on a global level. The World Wide Web Consortium is responsible for keeping standards in web protocol development such as HTML and XML. Basically they specify the standards that browsers use when supporting particular languages. The Internet Assigned Numbers Authority is one of the oldest Internet regulatory organizations, having started its activities in the 1970s. It is responsible for coordinating IPs and registries and regulates how they work together. The Internet has hugely affected print media. The possibility of having an online magazine or newspaper that doesn’t require publishers to print and transport hard copies has made it easier for a lot of small publishers to create a presence online. It has also made it necessary for major companies to have a website, since the public has come to expect news to be served immediately, instead of the next day or even weeks that is required for printed materials. It has also allowed individuals to start their very own news sites and for blogs to fulfil part of the role that was previously controlled solely by the printed media. Magazine and newspaper sales are down, although their website traffic is going up. The launch of a new generation of e-readers, such as the Kindle and the iPad are bound to impact printed materials even more. Could we be watching the end of paper magazines? Multimedia is one of the largest sectors of the Internet today. It encompasses pictures, sound, video, animation and other interactive content. In its infancy the Internet only allowed for sparse use of multimedia, due to its speed restriction and the capacity of the machines to interact with the content. Downloading even highly compressed pictures (like the computer on the left) could take minutes, so small, pixilated images were the norm. The idea of music and video seemed like a distant dream. Bad Gif animations were the most exciting things you would see on a site in those days. With the predominance of high speed Internet the use of multimedia in websites has become so common that one would find it odd to see a site that didn’t at least have pictures and graphic elements. Sites devoted entirely to multimedia, such as YouTube and Vimeo, are incredibly popular; music downloads have revolutionized the industry. The movie industry has also been deeply affected by sites such as Netflix 9 Tips & Tricks To Get The Most Out Of Your Netflix Subscription 9 Tips & Tricks To Get The Most Out Of Your Netflix Subscription Read More , which make it possible for people to stream new movie releases directly to their computers. Do you even remember video stores? Why would you bother when you can watch a movie on the go on your phone? Social networks are almost a synonym with the modern Internet. Since its creation, the Internet had been used as a means of social interaction. Chat rooms were one of the first venues for live communication among people that broke the barriers of space much like the telephone when it was created. The difference was that chat rooms created another form of interaction, where complete strangers would randomly find each other to exchange ideas of all kinds. The social format became widely known with the popularity of MySpace, which still exists, although it seems to be slowly disappearing into obscurity. MySpace at its peak in 2006 had 100 million avid users, and showed the world that there was a huge interest in the use of the Internet as a live social medium. Facebook is currently the leader of that trend, with over 500 million users. Businesses have also discovered the importance of reaching potential customers through social networks and are investing heavily in them. It is rare to find a business nowadays that doesn’t have at least a Facebook page and a Twitter account. 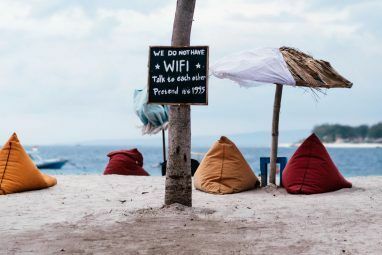 The need to be constantly connected has also prompted a lot of people and businesses to set up Wi-Fi How Does Wireless Internet Work? [Technology Explained] How Does Wireless Internet Work? [Technology Explained] Read More connections. 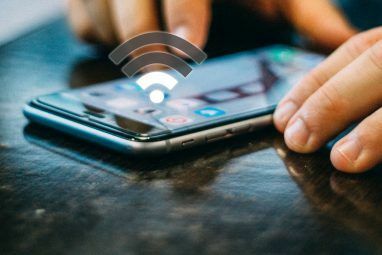 Wi-Fi is based on IEEE 802.11 standards that allow devices to connect to each other without the need for cables. One can easily set up a wireless network with an affordable wireless router connected to a wired one or directly to the broadband cable. That creates a lot of flexibility, particularly for those who wish to use laptops around the house and businesses who want to be able to set up computers without the need to worry about pulling cables all over the office. Wi-Fi can also be found in many business and public spaces as a way of attracting web users. In the past few years, the need to be constantly connected has meant that new ways of being online are constantly being researched. Mobile Internet has, in the past few years become so popular that a large number of businesses are creating websites and apps specifically for mobile devices. Phones, which used to be a device that allowed you to make phone calls and maybe send some text messages, have become miniature computers that not only give you access to the web, but also allow you to create documents, manage your finances, record video, take picture and share those online. Blackberries, iPhones, iPad and more recently the invasion of Android and Android tablets in the market has meant that Smart Phones will become an even larger part of Internet connectivity. Unlike land-based connections, mobile devices rely greatly on the use of Satellites How Satellite Internet Works? [Technology Explained] How Satellite Internet Works? [Technology Explained] Read More to connect users to the Internet. The changes in communications that can be attributed to the Internet are almost immeasurable. Even from its humble beginnings as a limited communication portal between researchers and scholars, the fact that the information could be shared so freely was revolutionary. The web, as we so commonly call it, is exactly that: something that connects all these points, and with that, all of us, and allows us to influence each other and share ideas in ways that were impossible before. As a child, when we were curious about something; we dreamed that there was a magic box….one that could answer any questions asked. That magic box exists now. Its name is Google. The implications are immense. Ideas can be shared among people from all over the world in real time. Newspapers have become “the old way of doing things” since you can find information on events within seconds of their happening. Emails have made letters a special thing one treasures instead of the only way of communicating with one another without the use of a phone. Websites have helped spread information that was previously only available in books, which had to be shipped to places, and stored, and which only allowed that information to be shared with the very few who had access to them in a library or who had the funds to purchase them. Most websites are available for free to millions of users at any given time. Businesses, hospitals and banks stopped relying on paper documents and started “digitizing” all their files. Information can now be accessed via databases, which means less is done by memory and subject to mistakes, or accidental destruction and more people have access to the information quicker. Whole infrastructures were developed so they could accommodate these changes. Buildings have been built to accommodate servers, cables and satellites had to be changed to better distribute the information, Internet based companies have appeared that function entirely virtually, without the need for a brick and mortar office. The measure of the development and potentials of many countries is being measured side by side with the level and know-how of its technology, because geographic barriers mean very little when the web is concerned. Basically, you can reach someone across the world the same way you can chat with a friend in your neighbourhood. The last decade has been the most transformative in generations. A whole new way of living has been created by the Internet, and it has started maturing in the past years and evolving into a new norm. Some of the apparent changes, such as email instead of mail and looking for websites instead of phone numbers in the yellow pages were just the tip of the iceberg. The media is changing its format to an almost entirely digital format. Magazines and newspapers have been morphing into websites and blogs, videos are becoming streaming media, and even TV has been slowly becoming more like the web. Options like rewinding live TV, recording it, scheduling it from a distance, streaming “On Demand” movies, and many other changes are a way of duplicating the users experience online while they watch TV. Google TV What is Google TV and why do I want it? What is Google TV and why do I want it? Read More , for example, is a gateway to a fully web based TV watching experience. Home phones are being slowly replaced by smart phones, which are again, an extension of the web into our everyday lives. Even the home and business phones themselves can now be web driven with VOIP services. Many applications and documents are now being stored in web clouds which mean that soon, most of our information will only exist in pixel form. We have in the short span of 10 years, changed from a mostly analog world, to a world controlled by virtual information and one can’t help but wonder what the next 10 years will bring. It is estimated that 1.7 billion people use the web. In 2010 that is only about 25% of the world population. North America – 77.4% (That’s right, 22.6% of North Americans do not have access to the web). – 90 trillion emails were sent in 2009. Out of those, 81% were spam Top 4 Freeware Spam Blockers That Actually Work Top 4 Freeware Spam Blockers That Actually Work Read More . – 148,000 new zombie computers are created to send spam everyday. – 84% of social networks have more women than men. – 64% of online gamers are women. – Facebook serves 6 million pages per minute. What the Internet has brought us is a whole new way of interacting with each other and with the world around us. We have more access to information than any other generation before us, but not all of the information is constructive and not all of the changes good. Many have failed to adapt to our new virtualized environment, and have been struggling to catch up with a world that seems to be changing quicker than a lot of people can catch up with it (and those who had to explain to your grandparents how to use Facebook can testify to it). 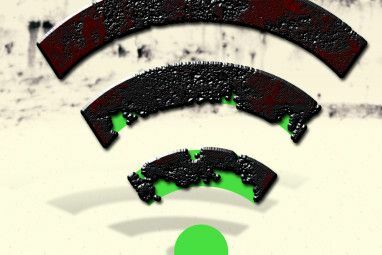 The other group that has been left behind by the technological revolution has been those in poverty or who live in countries with little Internet access. It is estimated that approximately 75% of people worldwide still don’t have access to the Internet, and with the needs to the world revolving around some of those services, the distance between those who can and those who cannot is bound to become even greater. For those of us who are privileged to have access to every new gadget and to every new advancement, the world has become a great big experiment. We read our books on Kindles, find directions via GPS on our phones, talk to our friends on Facebook and post Twitter updates about our new Foursquare mayorships Check In & Become Mayor of Your Favorite Venues With Foursquare Check In & Become Mayor of Your Favorite Venues With Foursquare Read More . We play fantasy games with people around the world and carry thousands of songs on players smaller than a deck of cards. The issue now is how to find a healthy middle ground. Our dependency on technology has, to a large extent, affected how capable we are of socializing and living our lives without it. The real challenges will be faced by the next generation, which will have lived in a world of people who haven’t experienced life without the Internet. Explore more about: Bandwidth, Longform Guide.